Crossone is the 444th highest place in Ireland. 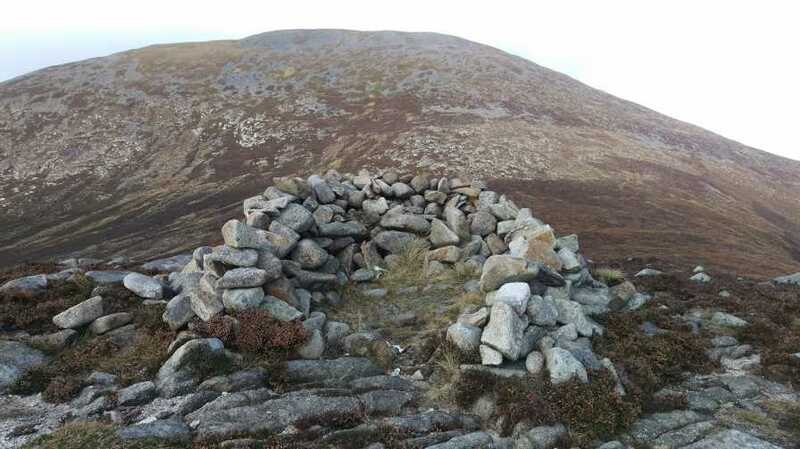 Crossone is the second most easterly summit in the Mourne Mountains area. From Bloody Bridge car-park walk west along the Quarry Track to J369267 A. At this point a broad grassy track to your right leads down to a crossing point across the Bloody Bridge River. On the north side of the river, follow the zig-zag track up gentle inclines to J368270 B where you’ll spot the ruins of an old stone hut. From here aim straight for the summit on a grid bearing of 350 degrees. and on to Slieve Donard. 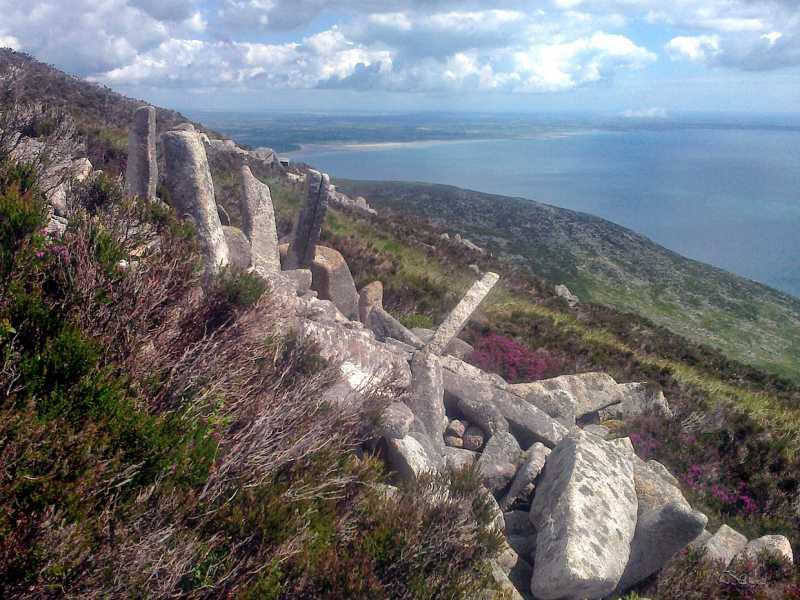 As a mere bump on the ESE spur of Slieve Donard, Crossone is unlikely to be considered a “destination” summit. Except by summiteers of course! It is however an obvious way-point on an interesting and challenging alternative summit of Slieve Donard on its steepest upper slopes. Ascend Crossone from the Quarry Track as per short summary description. Other than for a brief couple of moments, it simply defines dour. A thankless trail off the Midpace river (the Bloody Bridge track), itself, diva of the dull, through rushy bog and a raggedy ascent on to ... well ... nothing. It will give you a slightly new perspective on the lovely, low lying land south and east; it will get you a new if depressing entrée into the high fort; and it will test your patience. So mostly bad but not all of it. Still, on a hot fat summer's day, amongst the hot fat bees, the hot fat hare and a hot fat sky from here to Howth, it is sure better than weekend television.